In PeriPedal v2.4.8 the ability to automatically upload your workout to SportTracks has been added. Once you connect your profile to your SportTracks account your workouts will automatically be uploaded to SportTracks on workout completion. 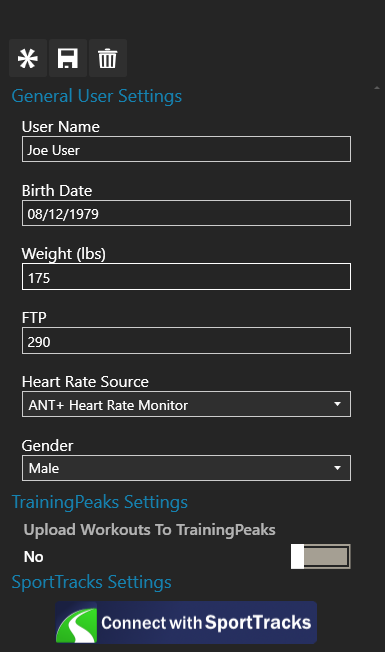 To set this up edit your user profile to connect it with SportTracks. To do this, click on “Edit Profiles”, select your user, scroll down to “SportTracks Settings” and click the button that says “Connect with SportTracks”. After clicking this button you will log into SportTracks and authorize PeriPedal to have access to your account. After this is complete your User Profile will show that your user profile is connected to your SportTracks account. You can always download the most recent released version of PeriPedal from here. As always, if you have any issues of have any questions please contact us. This version of PeriPedal connects to Strava. Connect your user profile to Strava under Edit Profiles. Once connected the workouts that you choose to save will be automatically uploaded to Strava. While you’re at it join PeriPedal’s Strava club to see how you stack up against other users. This version of PeriPedal allows you to pop-out your selected entertainment option (Local media or web content) to a new window. This allows users with multiple monitors to utilize them with PeriPedal. Auto playing and pausing of media is still supported as normal. My new favorite way to use PeriPedal is with the Netflix entertainment option popped out full screen on one monitor and PeriPedal full screen on the other, auto-playing and pausing as necessary. This version has two enhancements to make choosing your desired workout easier. 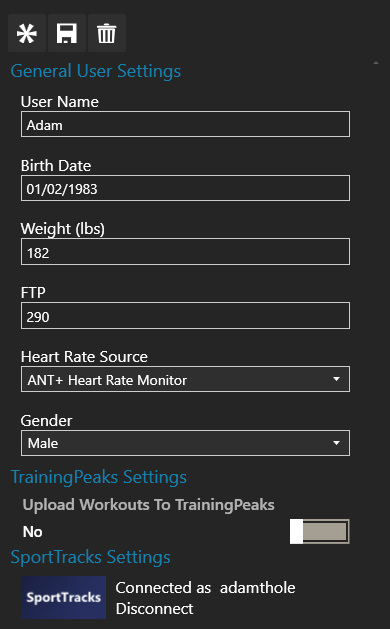 Each workout preview (and workout) now have a line indicating where the FTP is for that workout. This makes it easier to determine how difficult a workout is by sight. It also has a larger preview image that can be viewed by hovering your cursor over the desired workout. This version updates the PeriPedal workout collection to include all of The Sufferfest workouts. Fixed issues with pairing older CycleOps PowerBeam Pro trainers. Fixed issues with playing local media files. You can always download the most recent released version of PeriPedal from here. As always, if you have any issues of have any questions please contact us. If you are interested in trying PeriPedal click here for a free 30 day trial. PeriPedal v2.2.1 is now available with some new features and bug fixes. 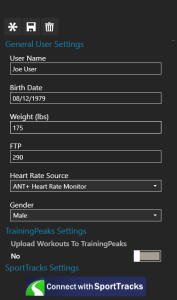 Note that the format of Bike Profiles has changed, so before you start your workout you will need to check all of your Bike Profiles, possibly re-pair your sensors, and save the profile. PeriPedal will not allow you to start a workout until your Bike Profiles have been updated and saved. 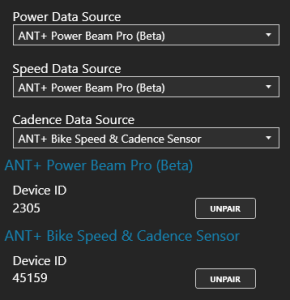 Support for control over the ANT+ CycleOps PowerBeam Pro has been added. To use, simply add the “ANT+ PowerBeam Pro (Beta)” as a source for your Power Data Source and/or Speed Data Source in you bike profile. Once your source has been set, pair your PowerBeam Pro and PeriPedal will control the PowerBeam Pro for you during your workouts. You can use ERG mode or set it to a slope of 0 – 25 percent. Calibration is not currently supported, but will be added in the future. PeriPedal is now compatible with Bluetooth Smart heart rate monitors. This feature is only available to users of Windows 8.1. 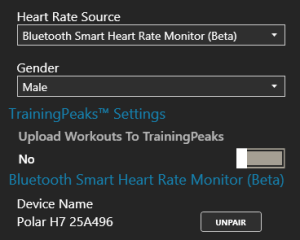 In order to use a sensor with PeriPedal you will first need to pair it to Windows (search for Bluetooth Settings) then change your user profile so the Heart Rate Source is “Bluetooth Smart Heart Rate Monitor (Beta)” and search for and pair your device. 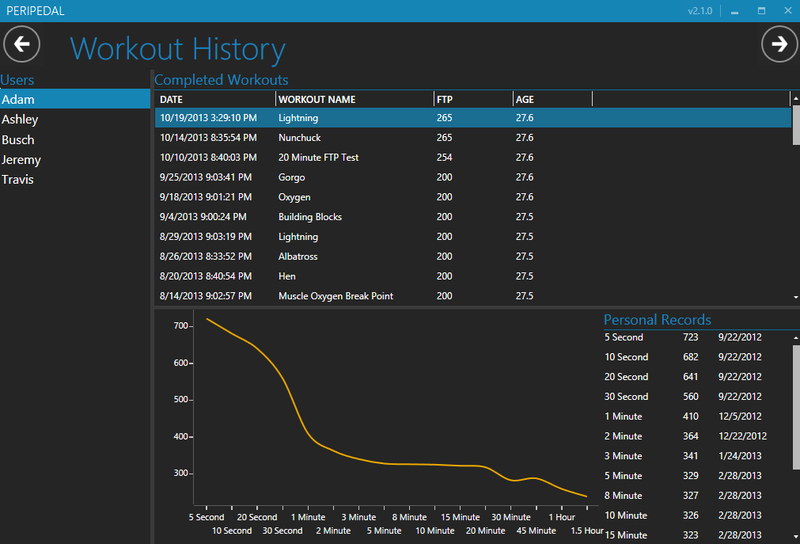 A new workout history screen has been added to make viewing workout history simple. 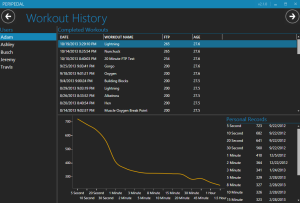 All of the past workouts for the selected user will be displayed and you can double-click on any workout to view the workout. The personal records for the selected user are also displayed. Personal records are now being calculated for each user and are viewable from the view history screen. New personal records will be automatically calculated at the end of each workout. User will be notified at the end of the workout if a new personal record was achieved. After upgrading you will be asked if you want to calculate your personal records based on your history. KICKR mode selection and calibrate button are now displayed right on user’s chart instead of hiding it in Quick Settings. Fixed issue with KICKR dropping out occasionally. Each .FIT file created is now marked with laps corresponding to the intervals of the workout. Several UI tweaks, most notably removed most of the gradients. Fixed several compatibility issues around the Web entertainment option. Fixed issue where the “Next Interval” power value was sometimes incorrect. Fixed issue where hot keys would not always register. 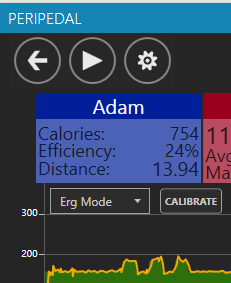 Fixed a bug that would sometimes occur when using the KICKR in an unstructured workout. PeriPedal v2.0.0 is now available. The biggest change in this version is the removal of the previous 8 ANT+ channel limit. PeriPedal is now using the ANT+ continuous scanning mode that allows a user to receive information from as many devices as they want. It comes with the added benefit of finding your ANT+ devices significantly faster at the beginning of a workout. With the removal of the 8 channel limit PeriPedal is changing its licensing from the single license for everything version it previously used to per user licensing. There are now 4 different types of PeriPedal licences: 1 User, 2 User, 4 User, and 8 User. The number of users refers to how many simultaneous users PeriPedal can support. All existing v1.x users have had their licenses upgraded to continue supporting 4 users in version 2.x. Removed ANT+ sensor limit. Previously you were limited to 8 ANT+ devices. Changed pricing structure based on number of users. Existing users will maintain 4 users. Many new exciting features are planned for upcoming 2.x versions! This version of PeriPedal adds support for the ANT+ Muscle Oxygen Sensor (alpha) profile. This will allow users of the Moxy Muscle Oxygen Monitor to display their saturated muscle oxygen percentage and total hemoglobin count during their workouts. PeriPedal support for the Wahoo KICKR has been significantly improved in this release. This release allows you to switch your KICKR mode at any time to and of the standard levels (0 – 9) or Erg Mode. You can change the mode by using the Quick Settings screen during a workout and selecting the desired mode. You can also use hot keys 0 – 9, or E to switch between modes. FTP Tests will default to Level 3, while all other workouts will default to ERG mode. The KICKR calibration has also been improved in this release. The previous release had a bug so the user wasn’t always shown the Calibration results. The previous release also hid the “Speed” value from the user during the calibration because the Quick Settings panel was open. The panel is now automatically closed once a calibration begins. PeriPedal now allows you to choose from Amazon Instant Video, Hulu, Netflix, Vdio, or YouTube as choices for entertainment during your ride. The web content of your choice is loaded in your PeriPedal window so you can easily adjust the ratio of the screen you want devoted to your entertainment and your data. The Local Media option is still available for those who prefer local content. If you choose Netflix of Local Media your entertainment will be automatically played and paused with your workout. PeriPedal now supports hot keys! Added Force Fluid Trainer and JetBlack Z1 Fluid Hydrogel Trainer power curves. Also included in this release are several bug fixes. A new release of PeriPedal is available. This version has 2 new features. The first is two new training plans created by Infinity Triathlon. One is a 6 week FTP booster plan and one is a 12 week Ironman training plan. The second feature is KICKR support! PeriPedal can now control the Wahoo KICKR trainer. This control is done over ANT+ and allows you to perform a workout with the KICKR in ERG mode and perform spindown calibration. To get your KICKR working with PeriPedal first update your KICKR to the latest firmware. 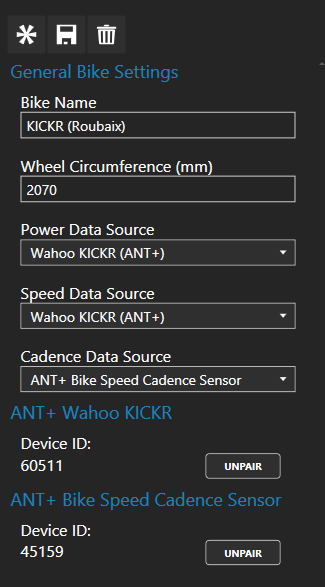 Then create a bike profile where you choose “Wahoo KICKR (ANT+)” as the source for speed and/or power. Having it selected for either one will enable ERG control. This allows you to use your existing power meter for your power data if you want, but still get the KICKR ERG control. Download the latest PeriPedal from here. 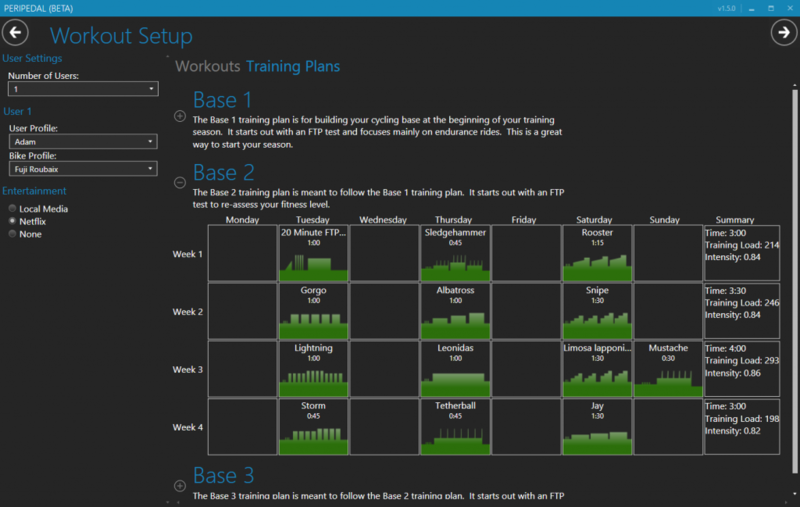 Added Training Plans to workout selection screen along with many new workouts. Added ability to search and sort workouts. Added ability to end a workout without saving. 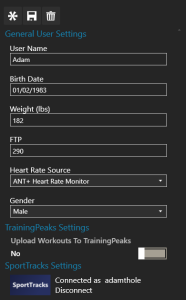 Added ability to auto-upload completed workouts to user’s TrainingPeaks account. Added Elite Crono Fluid Elastogel power curve. 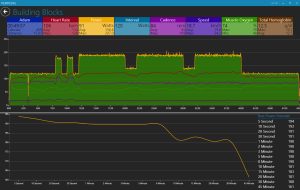 Added Tacx Satori (1 – 10) power curves. Added Tacx Bushido power curves. Added several Kreitler 4.5 Roller power curves. PeriPedal will prompt you to update within 24 hours. If you want it now you can download it from here. Made Edit Profiles screen more user friendly, particularly for first time users. Added CyclOps SuperMagneto Pro Trainer power curves. Added next target Wattage to interval display. Added Target Wattage percentage adjuster. When “Quick Settings” are open during a workout you will be able to change the target wattage from anywhere between 75% to 125%. Default is 100%. This will allow you to easily adjust the workout difficulty up or down depending on how you feel at the time without needing to adjust your FTP. Removed auto .FIT file creation on opening of history file – unnecessary now that it is done after a workout. Changed .csv output file type to .peripedal to void confusion with other .csv file types. Fixed issue with keeping computer on for some users.